Wise Data Recovery is a free file recovery program that shows all your deleted files in a familiar folder structure just like in Windows Explorer, which makes is very easy to use. Files can be undeleted from internal and external hard drives, MP3 players, cameras, USB devices, and more. This review is of Wise Data Recovery v4.1.3.217, which was released February 27, 2019. Please let me know if there's a newer version I need to review. Keep reading this review to see what I like and dislike about Wise Data Recovery, or see How to Recover Deleted Files for a complete tutorial on restoring deleted files. The number one feature that catches my eye when I use Wise Data Recovery is the fact that it's easy to quickly understand how recoverable a file is. All the files with a green circle next to their name have a "Good" recoverability status, which means the file hasn't been overwritten and can be restored normally. Other files may have an orange or red circle, meaning they are marked as "Very Poor" or "Lost," respectively, and will likely have no chance of being fully readable. It's also a huge plus that Wise Data Recovery can be used as a portable program. This means you can launch it from a drive other than the on you're restoring files from. For example, you could store the program on a flash drive to recover files from your main hard drive. The alternative to this would be installing the program to the same drive that has your deleted files, after which the installation files could overwrite the files you're trying to recover, thus rendering them unable to be fully resurrected and used again. That would not be good. Wise Data Recovery lets you search for deleted files by their name and extension. Clicking the small arrow next to the search box lets you choose presets like Images, Documents, Compressed Files, Emails, and Videos, which will auto-fill the search with common extensions in those categories, like MP3, WMA, and WAV for the audio selection. I also like the advanced search feature because you can put in multiple custom file extensions at once even if the preset options don't include them, such as PSD, TXT, and MKV, which, in this case, allows me to mix image, document, and video files into one search. I say above that when you undelete individual files with Wise Data Recovery that the folder structure isn't retained. This means if you recover several files from different folders, they will all be saved back into just one single location. This can make it hard to know where these files were originally. However, recovering a deleted folder will recover its subfolders in the same structure they were in when they were deleted. 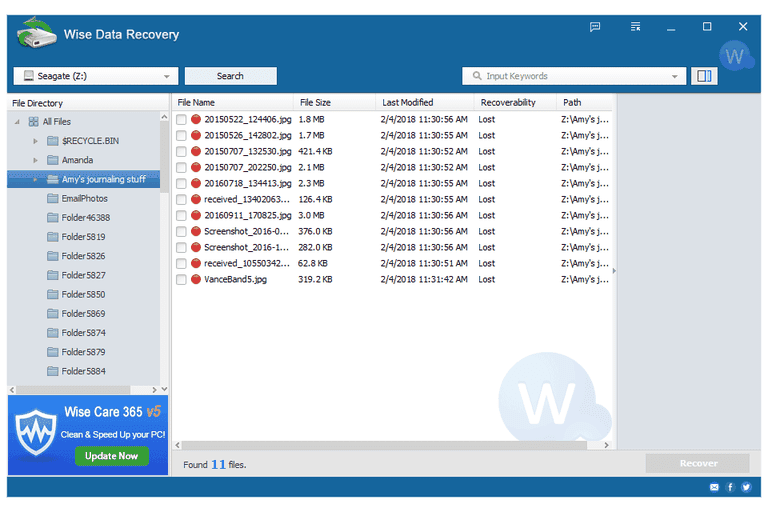 The portable version of Wise Data Recovery is also available at Softpedia.